A usually upbeat fire sign, Sagittarius’s are emotionally stable and a loyal partner. They are as strong as oak and as flexible as bamboo. While they may be swayed at first, the more pressure you apply to them the more they will dig in. Their roots are strong and their will is even stronger. Sagittarius’s are very loving and loyal and nothing gives them more satisfaction than to pamper their mate in every way they can. Sagittarius’s are kind people and will do just about anything for someone in need. They have a natural tendency to help their neighbours and assist wherever they can. Sagittarius’s make great firefighters, police officers, humanities assistances, or search and rescue workers. 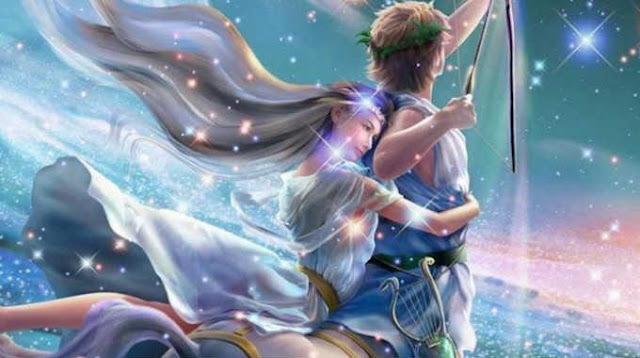 Because the Sagittarius is extremely imaginative,their greatest struggle will be manifesting their ideas into reality in the time frame they want to see it happen. This can frustrating for them as their visions are clear and their creativity is unparalleled. Through trial and error they have learned patience, but still can’t help but to get excited when a new idea comes whirling into their mind like a tornado. So get your 90″s extra large trousers out (that can fit a family of 5 in them) and hit it up. If there’s anyone in the world who can still make that look good, it’s a Sagittarius. Sagittarius’s don’t need anyone else to appreciate them (although they do revel in it) they place themselves on their own pedestal. They think well of themselves and highly respect their intelligence, creativity and imagination, traits that should be admired. On the downside they can exhibit a overinflated ego which needs to be kept in check only to ensure that they don’t lose sight of their goals. A Sagittarius’s will not stop until they reach their goal. Once they are set on an idea, they can become tunnel visioned and stuck on a something that may not be manifesting as they intended. Because a Sagittarius’s thinks so highly of themselves, when they are slighted or backstabbed, they just can’t imagine someone else doing that TO THEM. When you cross a Capricorn, you might as well pack your bags, because they don’t care who you are. They value themselves way more than how you have chosen to treat them, no matter what the reason. To help a Sagittarius’s with forgiveness, they should understand that when we are hard on others, it also reflects that we are too hard on ourselves; when we can’t forgive others, we also have trouble giving forgiveness to ourselves. A Sagittarius’s has a more practical and realistic view of the world than the other signs. They dream big, but can always get back to their roots. The cycle of this sign seems to regenerate itself with an upward surge of energy that is moving from its base to its crown and stability will depend on the Sagittarius’s energy flow. A Sagittarius that is out of balance will experience high-highs and low-lows which could be classified as “bi-polar or manic”. Root chakra balancing with the earth, is essential for a Sagittarius to thrive. A competitive nature can be a good thing. It’s a great motivator and Sagittarius’s never shy away from “finding out what they are really made of”. They enjoy challenges and aren’t afraid to put their money where their mouth is. On the negative, a Sagittarius can gloat a little and they need to be careful that they aren’t stepping on others in order to boost themselves to the next level.